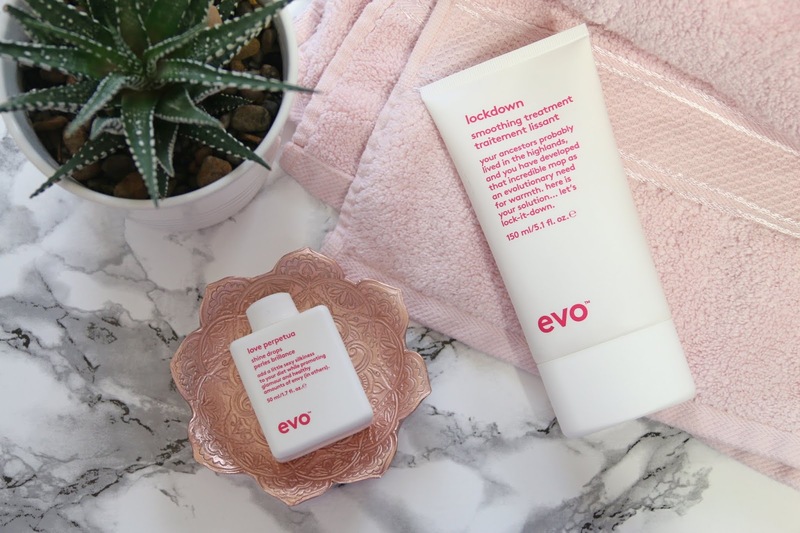 Girls, if you’re looking to smooth down those locks of yours and leave them gleaming then I’ve got just the ticket for you from salon brand, Evo Hair. This is a dream team that WORKS. There’s no fussing around as you can tell from the simplistic packaging; after a bit of waffling on with the tongue in cheek description, these products get straight down to business. 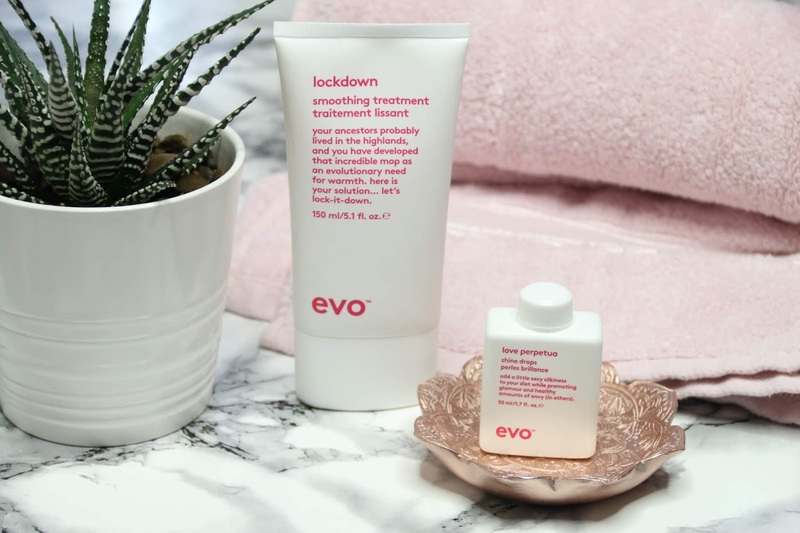 My first recommendation is Evo Lockdown, a leave-in treatment that’s designed to soften and smooth the hair from root to tip in preparation for styling. By treating the hair in this way, it becomes more manageable which makes brushing and styling easier. When I use this through the mid lengths and ends of my hair, blowdrying is a breeze and my round brush glides through my hair. I love how smooth the ends of my hair look, even when I’m due a cut, and the healthy shine my hair has when its dried. I’d recommend Evo Lockdown to those who have frizzy, unruly and colour treated hair because of its ability to fight frizz. My hair when blowdried is smooth and sleek when I use this product but if I skip it and just leave it to dry naturally, it is SO frizzy on the ends its unreal, so whether you have fine hair like I do or very thick hair, I think you could benefit from this product. Simply adjust the amount you use accordingly. When you want to amp up the gloss further, that’s where the Love Perpetua shine drops come in. I apply only a couple drops to the mid lengths and ends of my hair and can see instant results. Love Perpetua helps to seal the cuticles of the hair to reduce frizz and gives the hair a smoother, shinier and healthier look. The ability that this glossing liquid has to combat frizz is why it works so darn well in conjunction with Lockdown as they’re both aiming to achieve the same results; smooth, soft, frizz free hair. I’ve found Love Perpetua to be particularly useful when I’m going for a statement high ponytail or a classic up do because it smooths over flyway hairs, giving a much more sleek finish to my easy, quick hairstyles. These shine drops can also help to conceal the appearance of split ends, which is great news for those girls who don’t like to have their hair chopped too often. Remember ladies, the only way you’re actually getting rid of those split ends is with a good cut but if you’re waiting on your next salon appointment and want to tame the ends of your hair, then this is the product to reach for. Really, Love Perpetua is made for thick, unruly hair so if yours is finer, simply use less product. When it comes to a product that adds shine to the hair, you’re always better off taking a less is more approach until you achieve the look you desire anyway, no one wants to end up looking like a total grease ball! This Evo duo have been part of my haircare stash since the beginning of the year so they’ve had plenty of use. I’ve been able to test them out on my natural hair alone and on my hair extensions and I’m seriously impressed with the results. As they’re mainly a salon brand, they are a little harder to get a hold of than other professional haircare brands, which is a pain but a quick google search will lead you to some stockists on Ebay and Amazon, so all is not lost! I’ve actually found Lockdown online here, however I haven’t bought anything from that stockist before so I can’t tell you whether I’d recommend them specifically or not. Love Perpetua on the other hand can be found on tried and tested site Look Fantastic. I’ve been shopping on there for YEARS now because I love the discounts they give and the free worldwide shipping; who wants to pay for delivery these days? I certainly don’t! Has this post helped you to discover a new frizz taming product? Pin it for later! What do you use to smooth your hair? Let me know in the comments as I love to get your product recommendations and if you’ve tried anything else from Evo that you wanna shout about, I’m all ears!